Not all hollies are safe for consumption so it's important to make positive identification, as is the case with any wild edible. 11 years ago ago by Anthony Zukoff. Yaupon holly tea has been used for ages by southeastern U.S. Indian tribes for both recreation and ceremony. Early white settlers knew the tea as "the black drink." Ceremonially, it was sometimes made as a strong brew which intensified the tea's emetic qualities inducing vomiting and purification, hence the Latin name vomitoria. During the Civil War, southerners substituted yaupon holly tea for coffee and black tea. Leaves and stems of yaupon holly may be used fresh, dried or roasted and stored like any dried herbal tea. They were traditionally parched to a dark brown over a fire. The leaves may also be parched in the oven or on the stove top at 350-400 degrees F. It may then be stored in jars and can be brewed by itself or in combination with stems and/or fresh leaves. A simple tea is brewed by steeping just a few leaves in a cup of hot water for a few minutes and then straining out the leaves. Parching the leaves imparts a smoky flavor similar to yerba maté (Ilex paraguariensis). Again, it's important to positively identify the plant as Ilex vomitoria. Yaupon holly prefers maritime forests, salt marshes and woods and swamps of the coastal plain at elevations below 500 feet. Although its original range is limited to these areas, it now occurs in areas as far inland as the mountains of North Carolina, as it was traded and cultivated by Native American tribes. 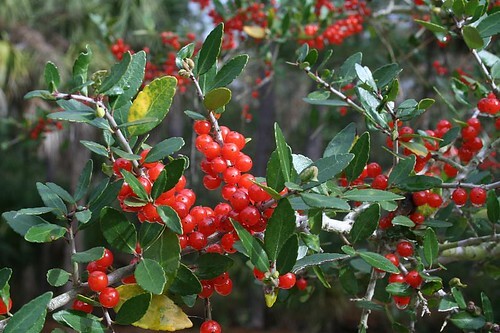 Spotting yaupon holly is easiest in the fall when clusters of red berries cover the female plants. To harvest leaves, grasp the stem near the trunk and slide the hand outward to strip off the leaves.